This is not a news that will affect any Indian for at least till next year and should not affect majority of Indian smartphone users for even beyond. However, this is an important and interesting development that should have huge impact in the coming years (at least until 5G comes into the market). Currently, Qualcomm is the only chip maker to include LTE radio in its SoCs. This means that any company interested in using LTE and doesn’t want its phone to burn holes in its user’s pockets would prefer a Qualcomm chip. The technology is nascent in India and will only take a corporeal form by next year when Reliance Jio will launch its LTE system across India and Airtel will have gained substantial grounds as well. 4G enabled smartphones will be available in all price brackets and most will be on Qualcomm SoCs irrespective of the brand of the smartphone. Till now, Samsung was one of those companies. However, with its Exynos ModAP SoC, this will change. This chip will be have a quad core processor built on 28nm HKMG (High-k /Metal Gate) Process. While it is not the same as an octa core Exynos 5 chip, the addition of LTE makes it perfect for mid-range smartphones of next year. 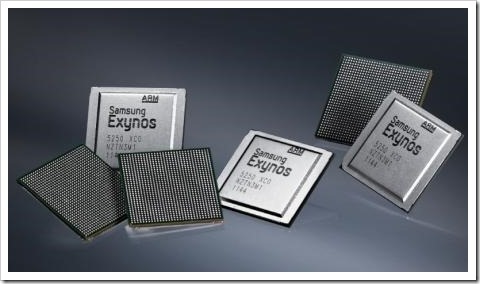 According to Samsung, these chips (Exynos ModAP) are capable of supporting the 4G LTE Release 9 of 3GPP and Cat 4, at both duplex mode, FDD and TDD, in addition to legacy 2G and 3G mobile interfaces. While this chip may lag a little behind the newest Snapdragon from Qualcomm (Snapdragon 805 supports Cat 6 LTE of upto 300 Mbps speed), it still puts it in the comfortable situation of independence. The devices powered by these chips can offer features like high quality video recording or playing back graphics in higher quality or format with its Image Signal Processing capabilities (up to 8MP 30 fps). Next year is going to be an exciting year for LTE network in India. It will take at least half the decade for 4G to actually take foothold in the country (hopefully less!) but next year will be when all the players (networks??) will jump in the game. We should see a lot of smartphones in the higher end getting LTE capabilities by next year. With this development, Samsung might bring it to its lower range as well. Also, new competition means Qualcomm has a reason to improve faster. What do you think on the matter? Microsoft To Launch $199 Laptops & $99 Windows 8 Tablets To Kill Chromebooks & iPads! Xiaomi Will Launch Company-Owned Mi Home Stores; Won’t Increase Smartphone Prices! Samsung is one of the best technology company of the world. It always introduced new technology in the market.